I am just now beginning to enter into the world of crockpot cooking. Just to be clear, I'm not so into it that I've bought my own crockpot, but I happily borrow friend's crockpots to experiment! I follow the recipe exactly. When I go to take out the food, I temperature test it to make sure it is safe to eat. The meat is WAAAAAAY above the safe temperature it needs to be at to eat. Would it taste better if I cooked it for less time and, therefore, reach a lower temperature? Well, I tried cooking it for less time, and I was horribly disappointed with how tough the meat was when it reached a safe food temperature. So, like any good, modern world cook, I put the lid back on the crockpot, let it cook longer, and opened up my laptop to search the internet for answers! Come to find out, you do need to cook the food much higher than the recommended safety temperature to tenderize the meat, and it needs to stay that temperature for a while! The answer depends on the type of cut. If you have a tender cut of meat then there's no reason to cook it any longer than then desired doneness. If you are using a tough cut then there's lots of collagen that needs to be broken down, and that requires moisture and time. You want to cook it until all the collagen is broken down as that will make the meat tender. That may take 2 hours, it may take 6, it depends on the cut and the thickness. The target temperatures described are based on food safety recommendations, not quality of product. With chicken, for example, it is safe at 165f. However, I prefer the dark meat to get to 180f, give or take (I go by visual and tactile qualities, not by temperature). If you want to make pulled pork or beef, the meat has to get up to around 200f. Same goes for shredded chicken, even -- the temperature has to get pretty far beyond the safe range for the meat to be shreddable. So I think the answer to your question is you should go by NEITHER time nor temperature, as long as your quality target exceeds your safety target. Fabulous! 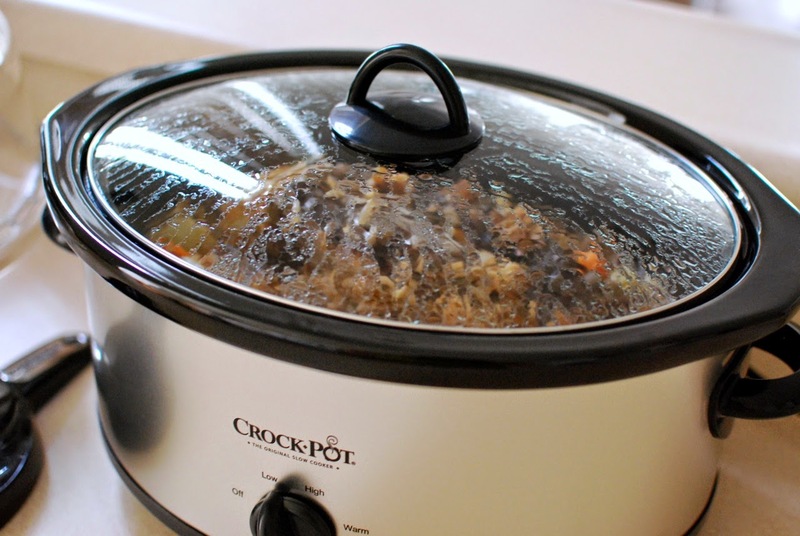 I have just spent the past couple weeks thinking about whether or not I want a crockpot (leaning towards yes) but haven't gotten around to really researching them (brands/prices/cookbooks)...if you do, let me know your thoughts please...I love the idea of putting a meal together when I have time (mid-morning) for dinner instead of cooking at the worst possible time of the day (right before dinner) when I don't have time. One concern raised years ago by my husband though was whether leaving something plugged in was really safe - can you catch your house on fire using one of these??? I researched brands, but they seem to be fairly inconsistent with reviews. I'm on the hunt for one at a thrift store instead!! The one consistent thing reviewers have said is that you want to get one with a shut-off timer so that you don't overcook your food.